Belgrade is a beautiful city – there is no denying it. From its wide boulevards with an eclectic mix of architectural styles to its countless hip coffee shops, Belgrade is photogenic to the max. Unfortunately, not everyone seems to have gotten the memo, and Belgrade continues to fly (undeservedly) under the radar. 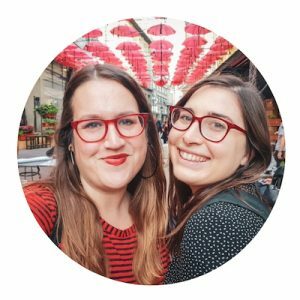 As lovers of all things Balkans, Belgrade is one of our favorite cities in the world, and it’s a city that between Stephanie and I we’ve spent a cumulative 4 weeks in. We’ve seen countless corners of this energetic, electric city. From our experience, here are our 17 top Instagrammable places in Belgrade that we’ve curated for you. At the bottom, we’ve chosen our favorite (and naturally the most Instagrammable!) places to stay in Belgrade, so if you haven’t figured out where you’re staying yet, check it out. 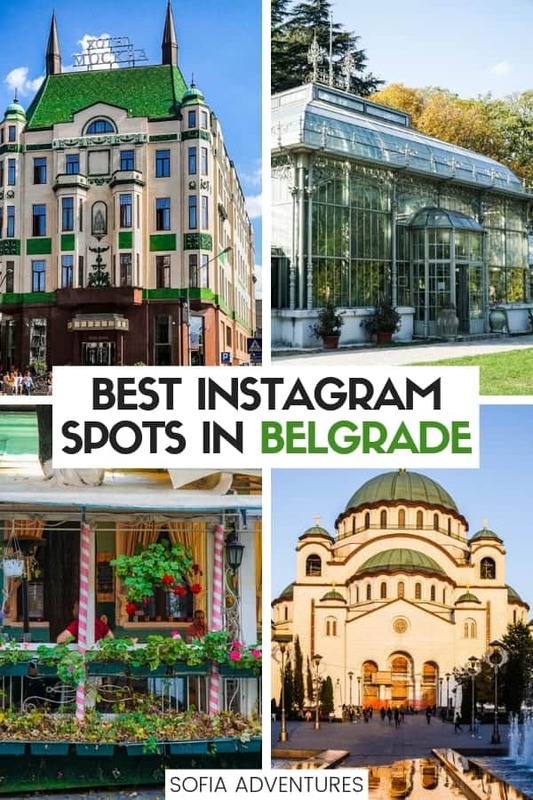 Well, you’re in Belgrade (Beograd as the locals call it) — you might as well let your Insta fam know. If you’re a fan of street art selfies, you’ll want to head over to the new Beograd mural in Dorćol. It’s written in Serbian and translates to “welcome to Belgrade.” There are also several other interesting murals in this area so you will have several opportunities to get some cool Instagram photos on this block. However, this mural is definitely our top pick for most Instagrammable place in Belgrade on this block. The most famous spot in Belgrade is undoubtedly the Belgrade Fortress in Kalemegdan Park, which overlooks the confluence of the Sava and Danube rivers with views of Great War Island and Novi Beograd. It’s a stunning place at any time of day but of course it is especially beautiful at sunset. Around sunset each day you’ll see tour groups traipsing through and couples canoodling (in my anecdotal experience, Serbs are serious offenders when it comes to PDA) the fortress, but it’s such a big area that it is quite easy to get an Instagram-worthy shot without anyone else in it. The best way to get a shot of Kalemegdan is with a drone, so if you are lucky enough to have one, you can get shots like this! I mean, how epic is that view? However, as always, if you are a drone pilot please make sure you follow all local laws to keep droning legal for the rest of us. As of writing this article (October 2018) you cannot fly a drone in Serbia without a permit and registering your drone. You can find some information on drone laws in Serbia here, but don’t let this be your only resource – do your own research on drone laws before you go as they change frequently. If you go to any one church in Belgrade, make it Saint Sava! Saint Sava is the biggest Orthodox Church in the Balkans and it is a sight to behold at any time of day, but it is especially beautiful in the evening and during the afternoon golden hour. Look for reflections after a rain storm for beautiful shots like this and get creative with your composition. Fun props like this person’s umbrella never hurt! If your feed is in need of some Wes Anderson vibes, head to Hotel Moskva (Hotel Moscow). This beautiful 4-star hotel in central Belgrade is retro chic to the max and begging to be photographed. I’m partial to a head-on shot from the exterior with those classic ‘devil horn’ looking towers, but the interior is also gorgeous and fit for the ‘gram. While Hotel Moskva is the clear show-stopper of the beautiful Terizije boulevard, there are countless other beautiful buildings worth photographing. Take the time to walk up Terizije starting at Palace Albanija, past Hotel Moskva, up to the Old and New Palaces. The whole boulevard is full of splendor, so keep your eye out. It’s a great spot for street photography as well! Churches always do well on Instagram, and the pleasantly symmetrical St. Mark’s Church in Tašmajdan Park is a stunner. It’s quite different than your typical rounded-dome Orthodox Church, so it’s a great architecture shot to add variety to your feed. Tašmajdan Park is one of the most beautiful parks in Belgrade and definitely worthy of an Instagram shot or two, especially in the autumn with fallen leaves or in the winter covered in snow. From the Orthodox St. Mark’s Church (above) you can get a beautiful shot of some of Belgrade’s vintage trolleys. There’s a little loop where the trolleys come in from the main street to pick up passengers and take a short break there. Just remember they still are live trolleys so stay aware. If you want beautiful sunset views over the Sava River, one of the two rivers that combine in the delta around Belgrade, you should take a stroll on Zemunski Put, a bridge that connects Novi Beograd and Downtown Belgrade. It has gorgeous views of the famous Ada Bridge, which looks especially beautiful silhouetted at sunset over the river. As a bonus, after you cross the bridge, you’re in the neighborhood for some excellent bars! Jazz Basta and Prohibicija are all quite close, near the foot of Branko’s Bridge. Location: Zemunski Put has great views of Ada Bridge, but there are other places in the city where you can snap it! Novi Beograd is a great place to go for their floating bars but it’s also great for night photography. From this side of the Sava river you get excellent views of charming Belgrade destinations like the clock tower and the Belgrade Fortress. Bring a tripod for great long exposure night shots! Location: Take photos from the Novi Beograd side of the river, north of the Branko’s Bridge. Gardoš Tower is also called Millennium Tower, and it is located a bit outside of central Belgrade in the suburb of Zemun. However, Zemun is such a photogenic and beautiful part of the city that you definitely should check out during your stay in Belgrade. Gardoš Tower was built in 1896 to celebrate 1,000 years of Hungarian settlement in the region, similar to many of the famous buildings of Budapest (Fisherman’s Bastion, for one). Zemun used to be part of Austria-Hungary for many years (whereas Belgrade was for only a few years). That’s why this part of Belgrade looks so unique and so different, as it used to be not only its own city but part of a completely different country! Zemun wasn’t absorbed into Serbia until 1918, and it became part of Belgrade proper in 1934. As a result, it has a distinct feel and is definitely worth spending some time in during your trip – it’s one of the most Instagrammable places in Belgrade, hands down! Pro tip: You can climb Gardoš Tower for beautiful views over Zemun for a small 200 dinar ($2 USD) entrance fee – bring cash. Zidić Bar in Zemun is an adorable rooftop bar where you can get some perfect lifestyle-y Instagram shots in Belgrade while also enjoying drinks and beautiful views over the city. Two birds, one stone – that’s how I like it! 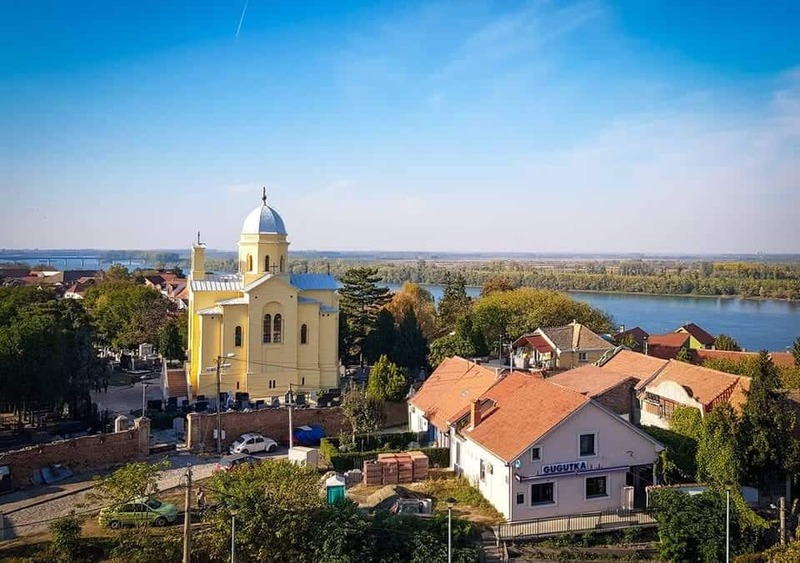 With its cobblestoned streets and plentiful outdoor seating, Zemun has the quintessential “Old Town” feel and is quite distinct from downtown Belgrade, which has a much more busy, bustling vibe. There’s no one street in Zemun that stands out as being especially photogenic, so just wander around and enjoy it, especially around golden hour! If you want to stay in a funky, Instagrammable hotel in Central Belgrade, check into Mama Shelter! It’s got a fun rock-n-roll vibe and a lobby packed with personality great for Insta shoots. But even better – look at those views. It’s worth booking a room just for those! Unfortunately, trains no longer run out of this railway station (hence the Old in the title, I suppose). But there’s no denying that the art nouveau style of the Old Belgrade Railway Station is uber dreamy and definitely worthy of being on Instagram feeds everywhere. Especially if you’re a train geek like I am! The Belgrade Waterfront is a new development project taking place on the main part of Belgrade, and you can get excellent views from the other side of the river. This view in particular was taken nearby the Green Bridge, aka Zemunski Put, which was featured earlier in this article. Location: Get your photos from the Novi Beograd side of the waterfront, facing old Belgrade, near Zemunski Put. NOTE: At time of writing this article (October 2018) it is not possible to get this shot as the Republic Square is under construction and this statue is blocked off. However, we hope that in the future, it will be easy to get photos here again. On our previous trips to Belgrade (in the summers of 2016 and 2017) this statue was available to take photos with, so hopefully you will be lucky and construction will be done. If you want a taste of Parisian-esque grandeur in Belgrade, the National Assembly Building is definitely the place to go. Beautiful at night from afar or on the stairs with the four columns, there are several great opportunities to get a good photo of this Belgrade gem. Budget: One popular choice is Balkan Soul Hostel, located in Stari Grad close to the National Museum and a convenient walk from all the hot spots like Kalemegdan Park, Belgrade Fortress, and the splavovi on the Sava River. Every bed has its own charging area and lights, which are essential to me when picking a hostel. It has a social atmosphere and friendly staff who can make your stay in Belgrade even more charming. Check out availability and reviews here. Mid-Range: There are so many great options in this price-range — Belgrade really excels at providing great value when it comes to accommodations in this price tier. One fun option is a floating hotel on the confluence of the Sava and Danube Rivers, San Art Floating Hostel & Apartments. While it’s located in Novi Beograd and therefore a little out of the action, I love the floating deck where you can have sunset drinks, and I like the that the décor is a little bit nostalgic, with details like rotary phones and old radios. You can check it out here. For a hotel in the center near all the main sights, we recommend the affordable four-star Zepter Hotel on Terazije, one of our favorite streets in all of Belgrade. It has all the amenities you’d expect from a 4-star hotel, like a gym room, in-room coffee machine, and a fantastic daily breakfast. Rooms sell out often, so check out availability and book in advance. Luxury: We’d be remiss if we didn’t suggest the classic luxury option in Belgrade, Hotel Moskva – one of our favorite buildings in the city and a classic haunt of famous politicians, musicians, actors, and other celebrities who pass through Belgrade. It’s also surprisingly affordable for its caliber! With a renowned spa, delicious restaurant (don’t miss the moskva schnit cake – we love it! ), and beautifully designed rooms, it’s one of our favorite places in Belgrade and the location is unbeatable. However, it’s almost always sold out, so be sure to check availability and book well in advance and hope you get lucky! If you want a more modern take on luxury, in a beautiful boutique hotel that is classy to the nines, we recommend Boutique Garni Hotel Townhouse 27. This hotel is beautifully designed in rich colors, with key details like fresh flowers in the rooms and a gorgeously-presented breakfast. The staff is helpful and courteous and you’ll love the location just off Knez Mihailova in Stari Grad. Check out availability here. Planning a Trip to Serbia? Don’t Forget Travel Insurance! Make sure you always travel to Serbia with a valid travel insurance policy. While the country is safe, accidents can happen anywhere. If you experience an accident or theft, travel insurance will help you recover your costs and enjoy the rest of your trip. I am reading through all your pages about Belgrade and I must saying that I am really impressed with the result. Maybe the best I have read about this city and I have read many of them. I also wanted to point out that some of the photos above don’t correspond correctly with the text and to historical facts you got wrong. Belgrade has been a part of at least Hungary at some time and Zemun did not become a part of Serbia in 1934 but after WWI, in 1918. Thank you so much for your kind words, Emil! And thanks for the correction about Zemun/Belgrade! We’ll amend the post. We try to do our research but with so many dates and invasions it can get so hard to keep it straight 🙂 Which of the photos don’t correspond, so I can fix it? Hi Emil, I actually think I caught the mistake you were talking about! We mistakenly called it the Eastern City Gate when that in fact is somewhere else 🙂 We changed it, but if you see any more errors, please feel free to let us know! We have made the appropriate changes to the date (it became part of Serbia in 1918 but part of Belgrade in 1934) and mentioned that Belgrade was under A-H rule for a few years 🙂 Thanks again!